The McLaren 570S Spider is a sports car designed and built by McLaren Automotive. The original McLaren 570S was unveiled at the 2015 New York International Motor Show. The mid-engined, rear-wheel-drive and two-passengers car was later revealed at the 2017 Goodwood Festival of Speed event as the McLaren 570S Spider, literally the convertible version of the 570S. Unlike other convertibles, the 570S Spider has the same performance and power as the coupe version and you get to enjoy the open-air driving alongside. There are few supercars on the market that gives you complete satisfaction at a very reasonable price and the 570S Spider is among them. 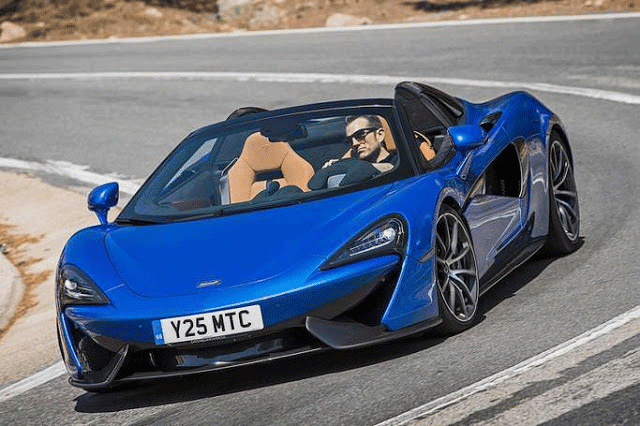 The lower-priced Sports Series line of McLaren which consists of the original 570S and the rather more practical 570GT has a new addition and it is the 570S Spider. 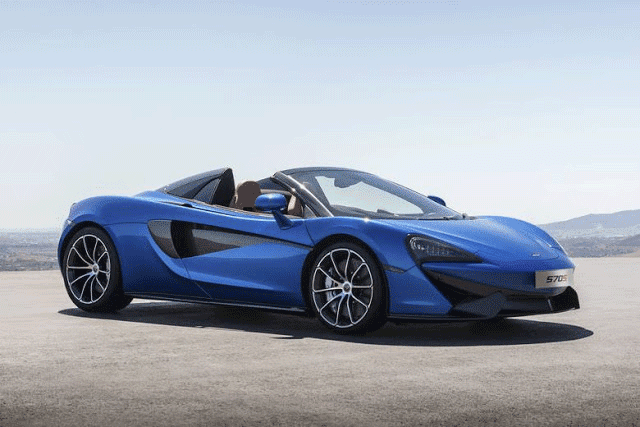 With the 570S Spider, McLaren Automotive believes that their sales volume could be triple by 2020. The car is a complete package: luxury, performance, power, convertible and relatively cheaper than other supercars. These aspects of the McLaren 570S Spider could skyrocket the company's sales during the upcoming years. This car, though recently released, has already marked itself on the list of many supercar lovers. As many people say that all McLarens look mostly the same, well, I cannot completely disagree with that. But, one thing is for sure, every curve, every little detail on a McLaren has its feature and use. The 570S Spider is another great example, its looks being completely similar to the original 570S but it follows the McLaren's philosophy of 'Everything for a reason'. A McLaren technology, usually used in its Formula 1 cars and now is being used in the Sports Series is the carbon fibre construction. This aspect makes the 570S Spider very rigid and gives it a lot of strength. This amazing technology sadly is not available on many other convertibles. Also, a great advantage of the carbon fibre construction is the fact that the car requires no additional stiffening of the chassis and it maintains its extreme performance, dynamic excellence and impressive perfection that is needed from being a McLaren. One thing that is completely new on the new 570S Spider except the folding hardtop is the new set of alloy wheels. The forged aluminium alloy wheels have been completely redesigned for the Spider. The new wheels are not only lightweight but they are also super strong. Wrapped around them are high-grip Pirelli P-Zero Corsa tyres. This powerful duo makes the car go around corners even faster. This combination brings a huge improvement in traction as well as braking. 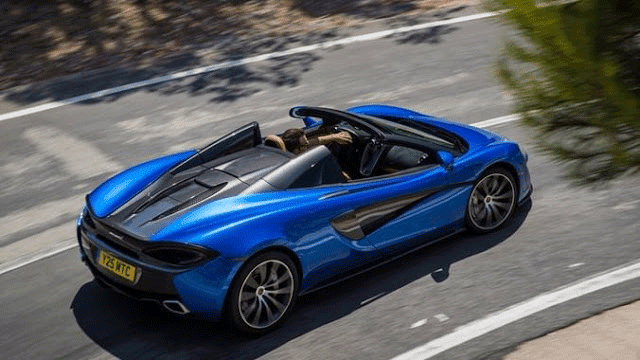 The McLaren 570S Spider uses an advanced roof folding mechanism. The two-piece aluminium hardtop folds itself completely into a compartment behind the seats at a press of a button. The whole process takes only 15 seconds to finish and the top can retract itself even at speeds above 30 mph (48 km/h). Unlike the 12C Spider and the 650S Spider, the 570S Spider does not need additional re-engineering for the folding roof mechanism, thanks to the carbon monocell used. As a result, the McLaren 570S Spider is only 46 kg (101 lbs) heavier than the coupe. I am personally not a fan of the soft top. I believe every car manufacturer, especially supercar manufacturer, should dump the soft top idea. Well, I guess many of you will agree with me that a soft car on a supercar looks ugly (sorry for those loving the soft top). A hardtop convertible, not only looks much more beautiful but is actually more reliable and more secure. A signature design on every McLaren is the dihedral doors. While this design makes the car looks much more beautiful and expensive, this design also makes getting in and out of the car easier and makes it much easier to get in and out in tight spaces. This beautiful design also directs air into the side intakes to the radiators. This one might surprise some of you out there. But hey, believe it or not, the McLaren 570S Spider is quite practical. Despite the fact that the car has an advanced roof folding mechanism, there are 52 litres of storage space at the back when the roof is up. And there is more as it is a mid-engined supercar. There are another 150 litres of cargo space at the front. This simply makes the 570S Spider a great choice for a weekend getaway. Now coming to the interior of the McLaren 570S Spider, one thing that everyone will notice, is the fact that it is like most of the other McLaren cars' interior. The interior is rather simple, very neat and it has all the controls and buttons where you would want them to be. In fact, all of the controls inside the car is positioned for easy use and to reduce distraction while driving. Once again, let me remind you that McLaren follows its design philosophy very well, 'Everything for a reason'. The seven-inch advanced touchscreen display lets you control almost everything, from climate control to satellite navigation to (optional) rear-view camera. You can get an upgrade from a standard four-speaker audio system to a Bowers and Wilkins twelve-speaker. This upgrade delivers crystal clear music through the entire cabin. The seats are finished in the finest hand-stitched leather that maybe your hands have ever touched. The seats are also positioned in the most convenient way and for a sports car, the seats are very comfortable, especially for a long journey. Expect to see a lot of Alcantara and carbon fibre on the dashboard and centre console. Let talk engine now, shall we? One of the main reasons someone gets a supercar is because of its engine and performance. 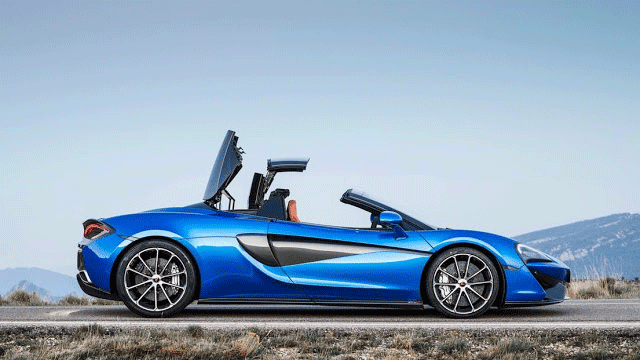 Well, the McLaren 570S Spider is packed with a 3.8L twin-turbocharged V8. This might be true to an extent that in every McLaren, there is a V8. But what is not true is the fact that all the V8 are the same. With each model, McLaren reworks on the engine, giving it just the perfect amount of power. This powerful engine makes 562 hp and 443 lb-ft of torque. While these figures might not look that extraordinary but keep in mind that the McLaren 570S Spider weighs only 1498 kg (3303 lbs). The car will accelerate from 0 to 60 mph in 3.0s flat and it will reach 100 mph in 6.2s. The 570S Spider will do a standing quarter mile in just 10.8s. It has a top speed of 204 mph (328 km/h). These figures confirm that the 570S Spider is worth to be on the supercars list. The McLaren 570S Spider is equipped with a seven-speed dual-clutch automatic with manual shifting mode transmission. The shifting is instant and it responds as soon as you flip the paddle. The handling, as in all McLaren, is always complimentary. The steering wheel does the job as you would expect it. There is no vagueness whatsoever. It is precise and it always makes you feel connected to the car and to the road. The steering wheel is neither light nor heavy. McLaren said that the first 400 units will be 'launch edition models' and they will be priced at $208,000. Let's compare this price to other McLaren models. The McLaren 650S Spider is $120,000 more than this and the McLaren 675LT Spider is almost $200,000 more. In other words, the McLaren 570S Spider is so attainable. Delivery of the car started at the end of 2017 and most probably, the first 400 units are already sold out. So, if now you are thinking about getting one, the McLaren 570S Spider starts at $191,400, which is a great bargain for a McLaren. Well, at this time, the McLaren 570S Spider is a great supercar, packed with a lot of luxury and performance and priced rather reasonably. Let's wait for some years to see what will these be worth. Let's see if depreciation will play its dirty game with the 570S Spider just like the 650S. If you like the article, please share it on any social platform of your choice. It really helps us to keep creating awesome contents for you. Also, if you have questions, tips, recommendation or anything else, feel free to write it down in the comments section and I will try my best to reply to all of them. Don't forget to subscribe to our newsletter for hot supercar related news and also to be the first one to know when we upload a new blog.